A Maricopa County sheriff’s deputy responding to a disturbance at a gas station was in for a wild ride. A naked woman greeted him, claiming she had been sexually assaulted, but then things took a bizarre turn. 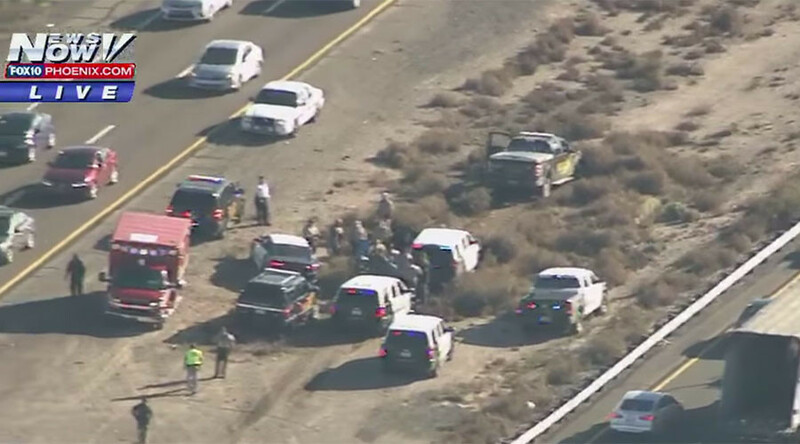 What followed was a high-speed pursuit along Interstate-8 that reached over 100 miles (161 kilometers) per hour. Not even spike strips could stop her until she crashed while trying to merge onto I-10 after driving 75 miles (120 km). The unidentified woman got into the deputy’s car at a gas station in Gila Bend, Arizona, when he went looking for her clothes and left the engine of his pickup truck running. Chief Deputy Ben Henry said the deputy was less concerned about potentially arresting the woman and entered the gas station to try to find something she could use to cover herself. Henry explained that this was not his department’s standard procedure, but felt it could have been justified given the circumstances. “Compassion towards victims is always our utmost concern,” Henry said. The deputy tried to stop her by running alongside the vehicle and then jumped on the running board of the truck, but was knocked off. A couple offered him their vehicle to pursue the woman which he accepted to maintain contact with his truck until backup arrived. After that, the woman traveled at high speeds for about 75 miles and thwarted the police’s every attempt to stop her including the use of stop sticks. It wasn’t until she attempted to merge onto Interstate 10 that a minor collision sent her into the median where she was met by officers. Even then, the woman allegedly remained non-compliant and refused to exit the vehicle. Officers used a non-lethal stun gun to subdue her. She has since been taken to a hospital, but her motivations remain unknown. “Once she was taken into custody, there wasn’t anything coherent,” Henry told reporters. Police are now looking into her claim of sexual assault, but Henry stressed that their primary concern was her health. He could not confirm whether she had been under the influence of anything but did say that she could potentially face charges once the investigation is completed.